Property Size 7,000 sq. ft. Experience true luxury at this 5 bedroom, 4.5 bath incredible modern lake view home. 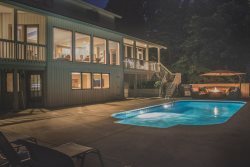 This almost 7000 sq ft mansion has been totally upgraded by the new owner with a new kitchen, infinity pool, huge hot tub, private gym, and private beach. The sleek, clean lines of Mediterranean style and the added drama of South Beach design make this an unusual find on the shores of our beautiful Lake Michigan. Situated on the beautiful lakefront, this home hosts huge open spaces and floor to ceiling windows with stunning lake views from almost every room. In addition to all this home has to offer, the amenities of Grand Beach are just short ride away (9 hole golf course, tennis courts, well-appointed playground). Through the front door we find a gorgeous great room. Wall-to-wall windows and generous skylights bathe the main level in natural light and give unparalleled views of Lake Michigan. The enormous open kitchen with two islands and ample counter space make hosting a dream. The dining table comfortably seats eight and the second kitchen island seats another five. A wet bar off the kitchen keeps kitchen space free with a wine fridge and built in Miele espresso machine. Still in the great room, the family area offers a large sectional sofa for watching TV or simply sitting in front of the modern gas fireplace. Also on the main floor is the master bedroom with an en suite bathroom including a large whirlpool tub and a walk in shower. An additional king bedroom on the main floor also hosts an en suite full bathroom. The downstairs is built for a good time. The family room has a great tv for catching the game, while a home theater offers an even larger screen and projector. Another wet bar keeps entertaining easy. Take advantage of the full gym, offering everything you need to keep up the routine, even on vacation. The large downstairs bathroom with an open shower makes cleaning up after the beach, pool, or gym a snap without tracking through the house. Downstairs, another spacious king bedroom opens out onto the patio. Another king bedroom and a three-bunk bedroom give additional accommodations for large groups. Outside, the infinity pool turns an already incredible view into an unforgettable experience. The ten person hot tub has plenty of room for everyone, even when there's a chill in the air. This home is a pure delight during any season! Please note: This property is not available for weddings, receptions, parties, etc. It is a family vacation rental only.